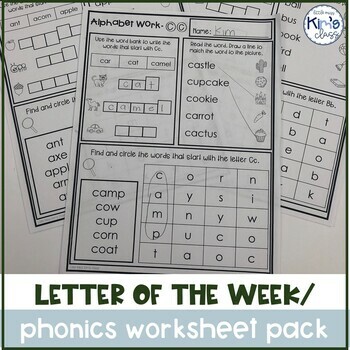 Letter of the Week Work Worksheets Differentiated! 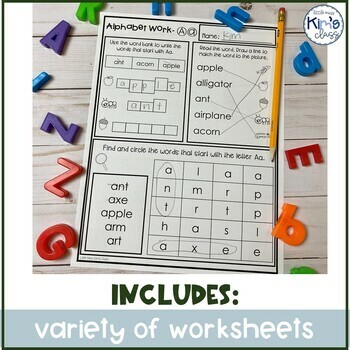 These worksheets are perfect to use during literacy, independent work or centers. They're great for students in ECE or kinder or students with special needs! They're differentiated for a variety of learners and are ready to print and go! -A writing worksheet for all 26 letters. -Each worksheet is differentiated into THREE levels! Level 1 is errorless, they can't get the tasks incorrect! Students are tracing letters and words and are circling letters and pictures to identify beginning letter sounds. Level 2 students are copying letters and words and are identifying letters and beginning letter sounds in a wider field. Level 3 students are copying letters, writing words without a model, and identifying letters and beginning letter sounds in a wider field. -A cut & paste activity for all 26 letters. 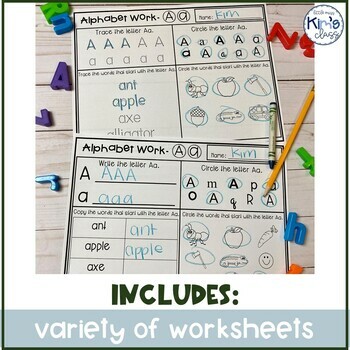 -Each worksheet is differentiated into TWO levels! Level 1 is errorless, they can't get the task incorrect! Students are cutting out pictures and gluing them all onto the letter to math the beginning letter sound. Level 2 is not errorless. Students are cutting out a variety of pictures and have to identify what pictures start with the letter on the page. 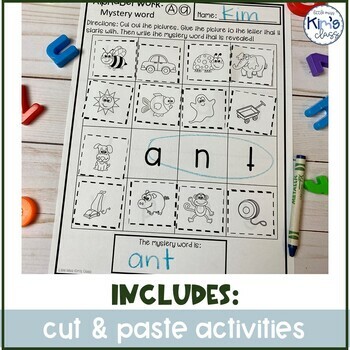 -A cut and paste beginning letter sound activity that reveals a mystery word for all 27 letters. Level 1 requires students to match letters paired with pictures to letters and then trace a 2-4 letter word. Level 2 students matching pictures to letters to identifying beginning letter sound. Then they are copying 2-4 letters to write a word. -You can print them all and put them in a binder/ book to create a little portfolio/ work sample for students! -You can send them home as homework to reinforce skills.